Waist circumference is the distance around your natural waist (just above the navel). 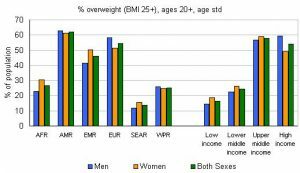 If your BMI is greater than or equal to 25 kg/m2, your goal for waist circumference is less than 40 inches if you’re a man and less than 35 inches if you’re a woman. BMI values less than 18.5 are considered underweight. BMI values from 18.5 to 24.9 are healthy. Overweight is defined as a body mass index of 25.0 to less than 30.0. A BMI of about 25 kg/m2 corresponds to about 10 percent over ideal body weight. People with BMIs in this range have an increased risk of heart and blood vessel disease. Obesity is defined as a BMI of 30.0 or greater (based on NIH guidelines) — about 30 pounds or more overweight. People with BMIs of 30 or more are at higher risk of cardiovascular disease. Some well-trained people with dense muscle mass may have a high BMI score but very little body fat. For them, the waist circumference, the skinfold thickness or more direct methods of measuring body fat may be more useful measures. How do you find your BMI risk level? Use a weight scale on a hard, flat, uncarpeted surface. Wear very little clothing and no shoes. Weigh yourself to the nearest pound. With your eyes facing forward and your heels together, stand very straight against a wall. Your buttocks, shoulders and the back of your head should be touching the wall. Mark your height at the highest point of your head. Then measure your height in feet and inches to the nearest 1/4 inch. Also figure your height in inches only. Find your height in feet and inches in the first column of the Body Mass Index Risk Levels table. 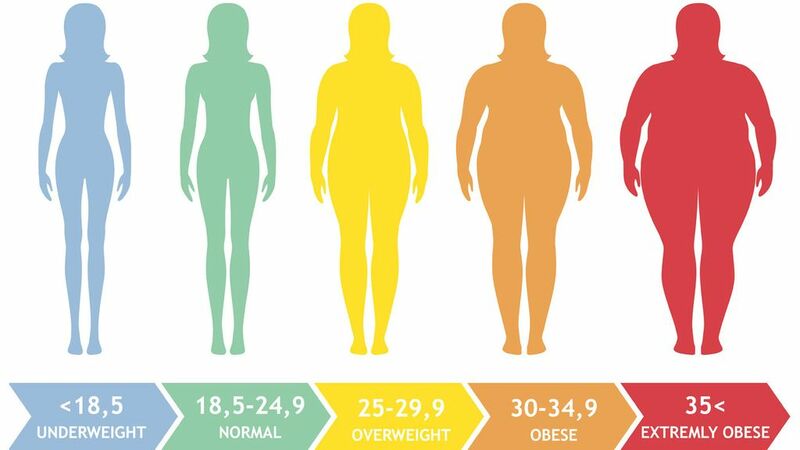 The ranges of weight that correspond to minimal risk, moderate risk (overweight) and high risk (obese) are shown in the three columns for each height. Congress has officially proclaimed September 2010 as the first-ever Childhood Obesity Awareness Month. We are all becoming painfully aware that pediatric and adolescent obesity is epidemic to our nation. According to the CDC (Center for Disease Control and Prevention), more than one third of U.S. adults — more than 72 million people — and 16 percent of U.S. children are obese. Since 1980, obesity rates for adults have doubled and rates for children have tripled. The consequences of obesity make our children at risk for adult-like disease such as hypertension (high blood pressure), Type 2 diabetes, orthopedic and joint problems, cardiovascular disease and cirrhosis of the liver, as well as psychological ailments associated with severe weight gain. With this being said, the Pennsylvania Department of Health’s (DOH) annual school health screening procedures now include calculating body mass index (BMI) to help track students’ growth patterns and identify potential weight-related health problems. For those not familiar with the term, BMI is basically a measurement using height and weight. BMI = weight (kg) / height (m)Ç BMI does not measure body fat directly, but research has shown that BMI correlates to direct measures of body fat. It is screening tool and not a diagnostic tool (Barlow and Dietz, 1998). So the question is, what do we do with this BMI report card that the school nurse sends home? If your child is categorized as overweight or obese, making the right decision will not be easy. But to determine if excess fat is a problem, a health care provider may need to perform further assessments. These assessments might include skin fold thickness measurements, evaluations of diet, physical activity, family history, and other appropriate health screens. Many parents may use this as a starting block for family fitness, better food choices and overall healthy lifestyle, which is always good practice whether your child has a weight problem or not. Others may choose nothing as they may not really know what to do for their overweight child. Join a gym? See a doctor? Get a personal trainer? Most insurances do not cover weight management services in their medical plans despite the medical implications that obesity may cause. Lastly, weight management is a team effort. Singling out your child to lose weight without the support of the family will not be effective. Make a commitment for the entire family to make some positive, healthy changes such as healthier snacks and meals, less TV and more family activity. Dr. Hassink also suggests, “the changes that will help your child manage his/her weight today could also keep a serious illness from developing later.” And that is good food for thought. Contributor Annie Linton, M.Ed, CPT, is a Pediatric Clinical Exercise Physiologist at Children’s Hospital of Philadelphia, personal trainer and adjunct professor in exercise science. She resides in Springfield.